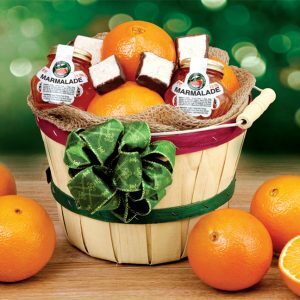 This charming wooden peck basket is filled with our famous, sun-ripened, fresh-picked Sweet Navels and our Deluxe assortment: two jars of Florida marmalade and six chocolate-dipped Coconut Patties. 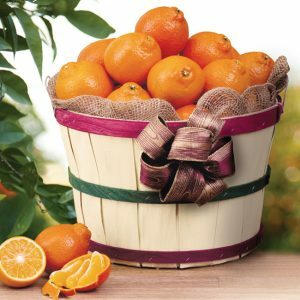 Our genuine half bushel grove basket is overflowing with Florida’s freshest citrus – sweet Navel Oranges, wonderfully juicy Ruby Red Grapefruit and easy-to-peel Tangerines. 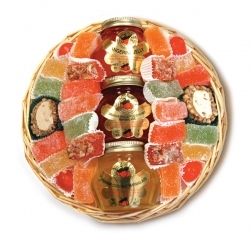 Enough for family, friends and holiday guests. 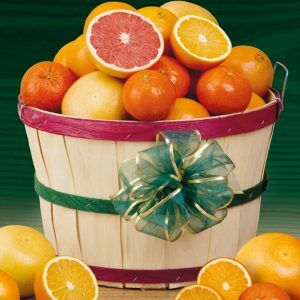 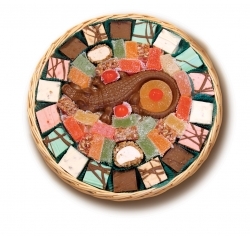 And when the fruit is all gone, you’ll have a wonderful basket for crafts, gardening or holiday decorating.